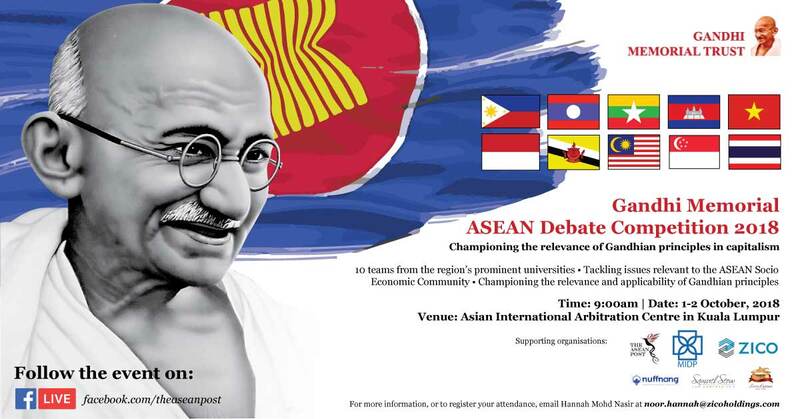 The ZICO Group is proud to announce its support of the Gandhi Memorial ASEAN Debate Competition 2018 (“Competition”). Organised annually by the Gandhi Memorial Trust, Kuala Lumpur every 2 October to commemorate the birthday of India’s national father, Mahatma Gandhi, the Competition (previously the, “Gandhi Memorial Debate Competition”) is the brainchild of former Malaysian Court of Appeal Judge, Dato’ Mahadev Shankar. The Competition was introduced in 2015 as a national competition for institutes of higher education in Malaysia. In the past, participants from across Malaysia were pitted against issues centered on the Gandhian principles of Ahimsa (Non-Violence) and Satyagraha (Truth). Topics challenged the young legal minds on issues concerning the adversarial system of justice adopted in Malaysian courts (and most common law/commonwealth countries); the impact of British colonialization on its colonies socially, politically and economically; and the nuclear solution for sustaining world peace. This year, the Competition takes an ambitious step out of its national boundaries. This year will be the Competition’s first regional venture, featuring topics centred on ASEAN socio-economic issues and top-tier ASEAN institutions to represent each of the 10 ASEAN Member States. The ZICO Group in its capacity as supporting organization will be offering internships to this year’s batch of deserving participants. To top it off, ZICO’s own Mr Paul Subramaniam, Mr Amin Abdul Majid and Dr Maung Maung Thein of ZICO Holdings, Zaid Ibrahim & Co and ZICO Law Myanmar respectively will be making an appearance as judges at this year’s programme. Joining ZICO to support the Competition are the Malaysian Institute of Debate and Public Speaking (MIDP), The ASEAN Post, Little Caterers, Nuffnang and, of course, ASEAN. Those interested to attend the Competition as guests may contact the Competition Administrator, Ms. Noor Hannah Mohd Nasir at *protected email*. Those unable to attend the Competition in person may catch the livestreaming event on The ASEAN Post’s official Facebook page, //www.facebook.com/theaseanpost.